The examination, treatment and interpretation of diagnostic studies and laboratory tests you received in the emergency department have been provided to you on an emergency basis only and should not be considered to be a substitute for comprehensive, all¬inclusive medical care. Any specialty tests (e.g., EKG, x-rays, etc.) that you may have been provided have been interpreted by the Emergency Physician on a preliminary basis. You will be notified promptly of any findings that we feel are significant. 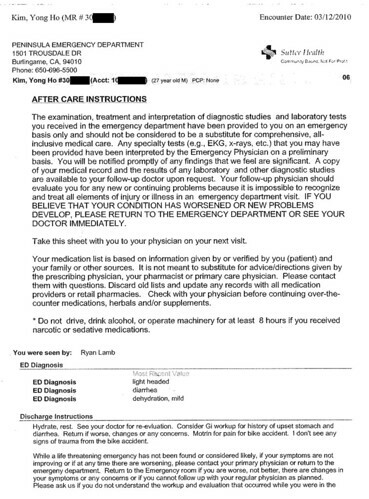 A copy of your medical record and the results of any laboratory and’ other diagnostic studies are available to your follow-up doctor upon request. Your follow-up physician should evaluate you for any new or continuing problems because it is impossible to recognize and treat all elements ‘of injury or illness in an emergency department visit. IF YOU BELIEVE THAT YOUR CONDITION HAS WORSENED OR NEW PROBLEMS DEVELOP, PLEASE RETURN TO THE EMERGENCY DEPARTMENT OR SEE YOUR DOCTOR IMMEDIATELY. 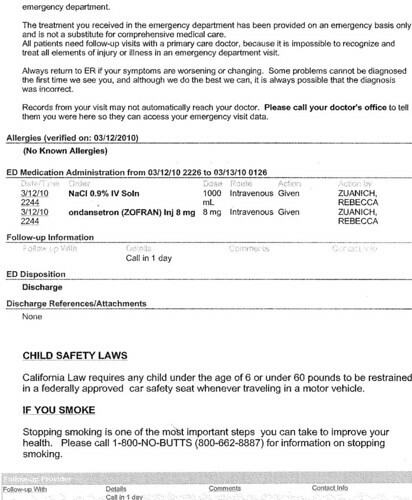 Take this sheet with you to your physician on your next visit. Your medication list is based on information given by or verified by you (patient) and your family or other sources. It is not meant to substitute for advice/directions given by the prescribing physician, your pharmacist or primary care physician. Please contact them with questions. Discard old lists and update any records with all medication providers or retail pharmacies. Check with your physician before continuing over-the¬counter medications, herbals and/or supplements. Do not drive, drink alcohol, or operate machinery for at least 8 hours if you received narcotic or sedative medications. !1J~”£.~.~!.~!.~J!!!ns?~t:!:rllJ~.~c~ti~~o~n~s_. ._, .~_._ … .. _._,. __ ._._ .. _ .. _. __ …. __ . ._. . __ ._. __ ._. …. __ .. __ . Hydrate, rest. See your doctor for re-evluation. Consider Gi workup for history of upset stomach and diarrhea. Return if worse, changes or any concerns. Motrin for pain for bike accident. I don’t see any signs of trauma from the bike accident. The treatment you received in the emergency department has been provided on an emergency basis only and is not a substitute for comprehensive medical care. Ali patients need follow-up visits with a primary care doctor, because it is impossible to recognize and treat all elements of injury or illness in an emergency department visit. Always return to ER if your symptoms are worsening or changing. Some problems cannot be diagnosed the first time we see you, and although we do the best we can, it is always possible that the diagnosis was incorrect. Records from your visit may not automatically reach your doctor. Please call your doctor’s office to tell them you were here so they can access your emergency visit data. California Law requires any child under the age of 6 or under 60 pounds to be restrained in a federally approved car safety seat whenever traveling in a motor vehicle. Stopping smoking is one of the most important steps you can take to improve your health. Please call 1-800-NO-BUTTS (800-662-8887) for information on stopping smoking. I s- emnsu a ea ervlces . Please refer to hospital account numbers for all inquiries and correspondence. This detail bill reflects charges, payments and adjustments posted on this hospital account as of the date this detail was rinted. ~ With You. For Life. ———- — _.—- ——- . Please refer to hospital account numbers for all inquiries and correspondence. This detail bill reflects charges, payments and adjustments posted on this hospital account as of the date this detail was printed.